Why I'm super nosey! Yes I admit it. Nothing better than a snoop about. I'm back from my holiday and playing catch-up. I have a couple of recipes sitting patiently waiting to be shared, but first I thought we'd have some fun. Last month I dared to show my fridge with you. Luckily it had been tidied up the week before and a shopping trip had filled it nicely, but I wasn't content just sharing my fridge, oh no, I wanted to see yours too. Some of my readers gasped in horror and slowly backed away, but a few brave souls stepped up to the plate fridge. Prepare for a good snoop! The Yogi Vegans are Sarojini and her husband Nandasuta. They started out as the Yogi Vegetarians, but along the way became vegans, hence the name change. They try to lead a very healthy life and live frugally. They grow their own veg and are both practitioners of Bhakti Yoga. Do pop over and say hi to them. 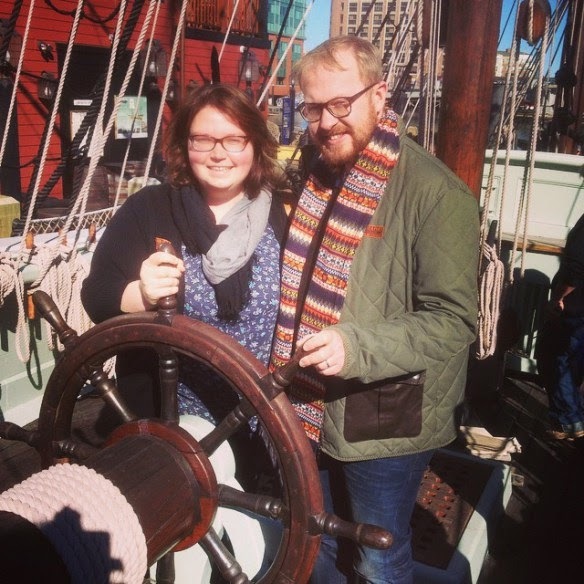 Into the Glade is a shiny new blog written by the lovely Lisa from the Wirral. Lisa has actually been one of my most loyal readers for years and I'm so glad she took the leap and started her own blog. Lisa's blog is a comforting family blog where you can follow her, her family and their gorgeous Labrador Jack. Lisa's fridge is pretty darn tidy and full of lots of goodies too. Lots of vegetables, cheeses, a rogue can of lager and nail varnish in the door. I have to admit I haven't heard of that before. I've heard of people keeping lipstick in the fridge when it's hot, but nail varnish, nope never. Lisa also has another fridge in her garage for overspill vegetables and alcohol. 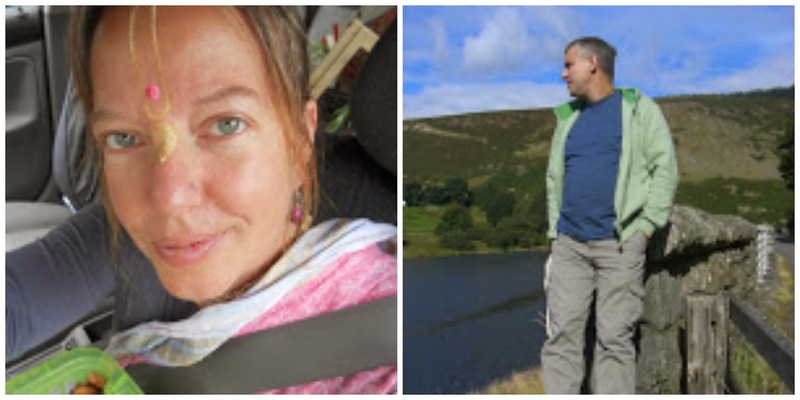 Lavender and Lovage is written by Karen Burns Booth. Karen divides her time between North Yorkshire and South West France. Her family live in the UK, but she lives with her husband in France. The best of both worlds, I think you will agree? I've been friends with Karen online for years now and we've been lucky enough to meet up a few times too. Karen's fridge very much reflects her personality. She is a very busy lady and so is her fridge. It's so full of goodies I'm getting hungry looking at it. Karen's fridge is full of salad, including grated carrot which they love, orange juice, cheese, grated cheese, cat food, cream, home-made blood orange curd, crème fraîche, butter, margarine, anchovies, sauces, chutney, pickles, sliced ham, sliced cheese, milk, goat’s mill and a bottle of lemonade. I'm surprised there is no wine! I'm suspecting another fridge! Maison Cupcake is written by my good friend Sarah Trivuncic. Sarah lives in a gorgeous house in Walthamstow, East London with her husband and super techie little boy. She originally started her blog to show off her baking skills, but she's broadened it since then to include lots of delicious family meals. 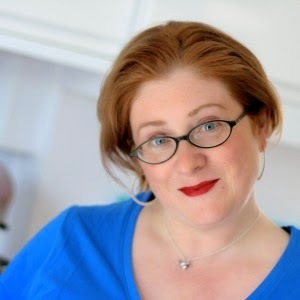 Sarah has written a rather fabulous baking book called Bake Me I’m Yours: Sweet Bitesize Bakes. Do check it out! 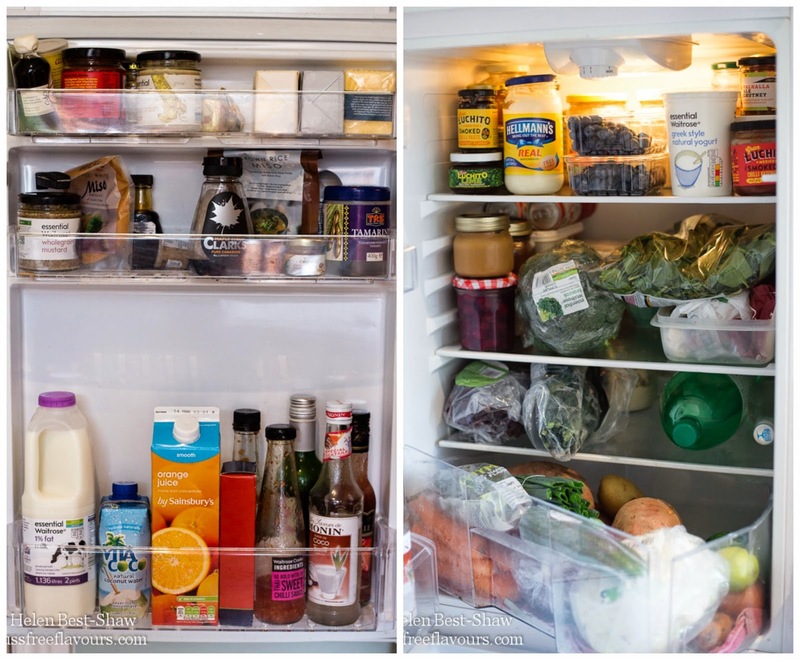 Sarah's fridge is super organised and if you head over to her post you can read her top 20 tips to keep your fridge clean and tidy. 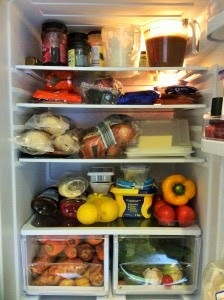 Sarah has loads of veg in her fridge and especially bell peppers. She bought a bumper batch, so she roasted a load of them and is storing them covered in oil, the rest are fresh and just waiting to be used. She also has cheeses, meats, prepared meals and a variety of condiments. You'll notice the fizz in the fridge door. Our Sarah loves a glass of fizz. Oh yes and bread in the fridge! Does anyone else do that? Mess in the Ness is written by Susan a fellow Scottish food blogger. 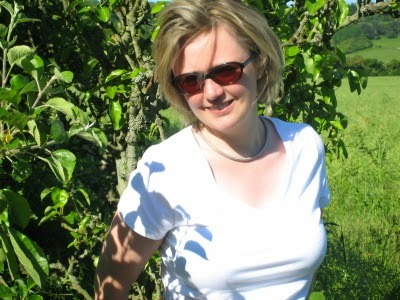 Susan lives in Inverness with her husband. 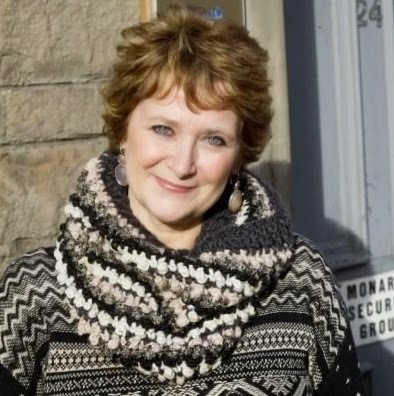 I actually had the pleasure of meeting Susan at my cousin Claire's baking club (Fife Baking Club). Yes, we food bloggers to have the tendency to meet each other in real life as well as online. It really is a great way to make friends with the same interests. Susan's fridge is stowed out as we say here in Scotland. The first thing I noticed is the homemade Lime Cheese, so I have to ask Susan is this the same as lime curd? There's also yoghurts, cream, chutney and cheese. 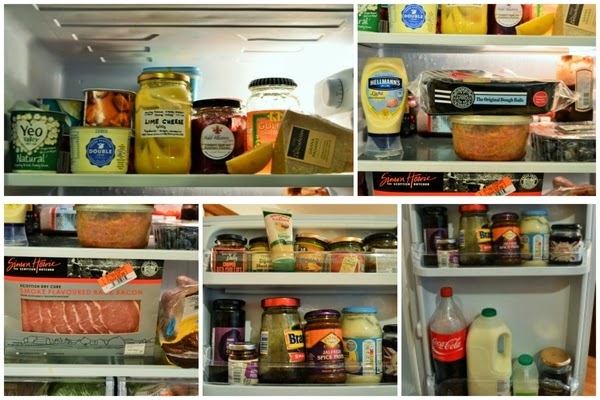 Sauces, mayo, fruit, leftovers, doughballs, meat, poultry, vegetables, condiments, coca cola and milk. Fuss Free Flavours is written by another good friend of mine Helen Best-Shaw. Helen lives in London with her fiance and her recipes are all about seasonal food and fuss free cooking. If you want to see some gorgeous food photography, head over to her blog. Helen's fridge is very like mine. Lots of veggies, some milk, fruit juice, condiments, mayonnaise, yoghurts, jam and cheese. She also is just as nosey as I am! Go read her post and find out just how nosey. Do visit some of these lovely bloggers and say hi when you have a minute. 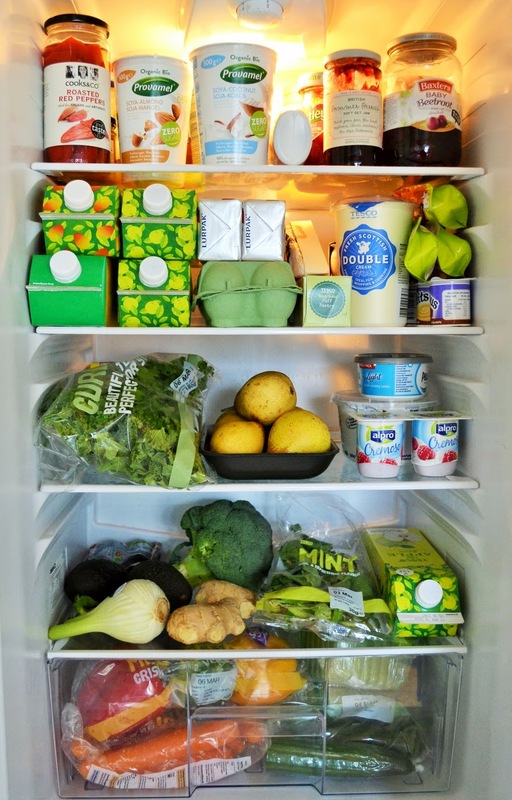 SO nosey and your fridge is full of delicious stuff! 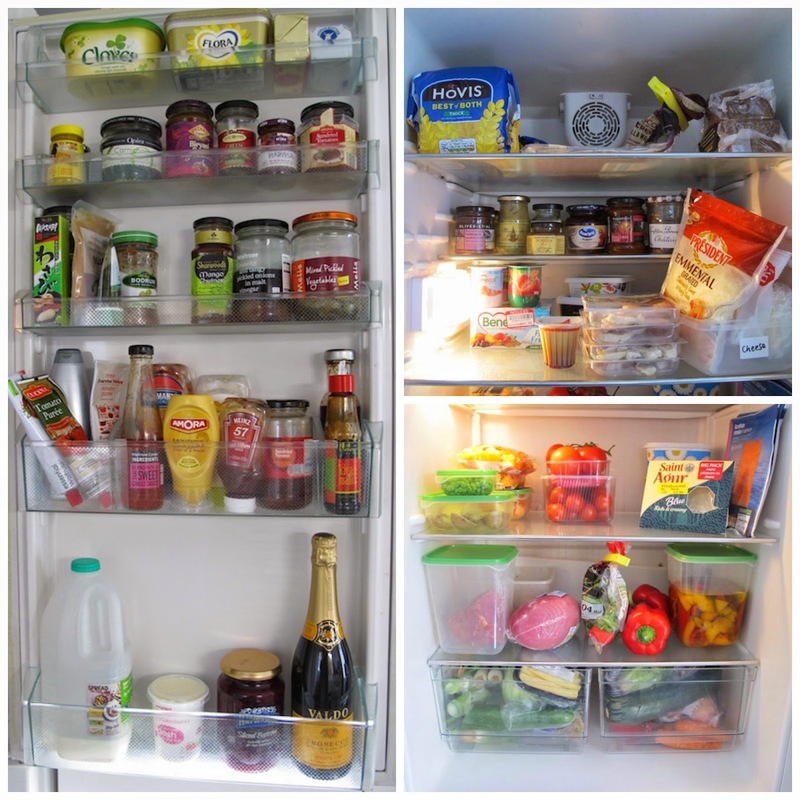 Wow my fridge in comparison is empty! Loved having a nosey and acquainted with lots of the bloggers here. Am I the only one who looked at the pictures thinking "ooh yes, I've got some of that/one of those"? Loved seeing those aubergines in the bottle shelf too - brilliant! No, I did that too Helen. Yes good idea for storing aubergines. That made me smile too. Great post! I think everyone has a curiosity about others. 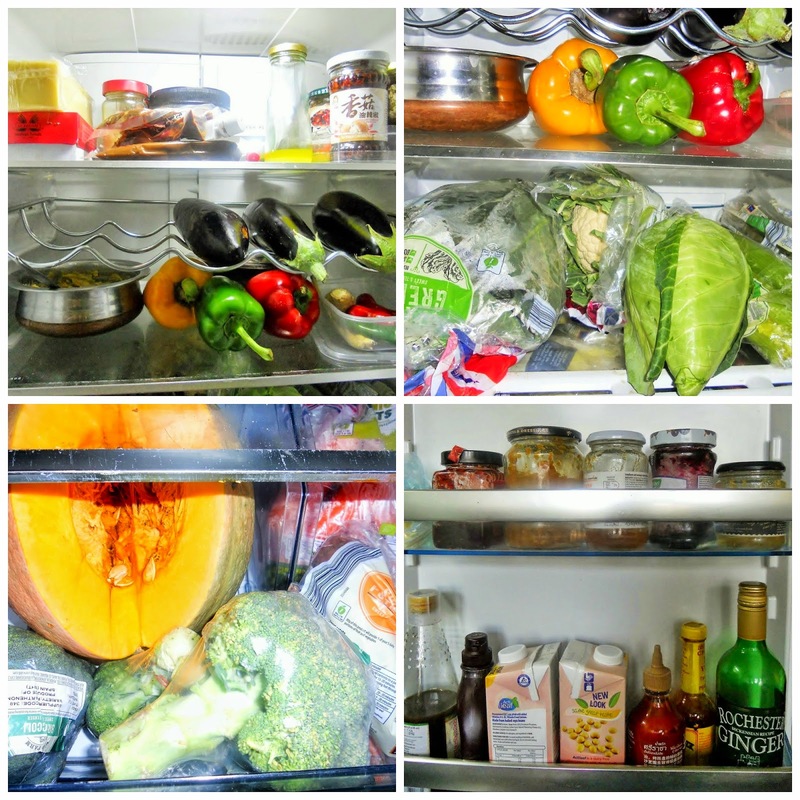 Thanks for sharing what your fridge and others look like. 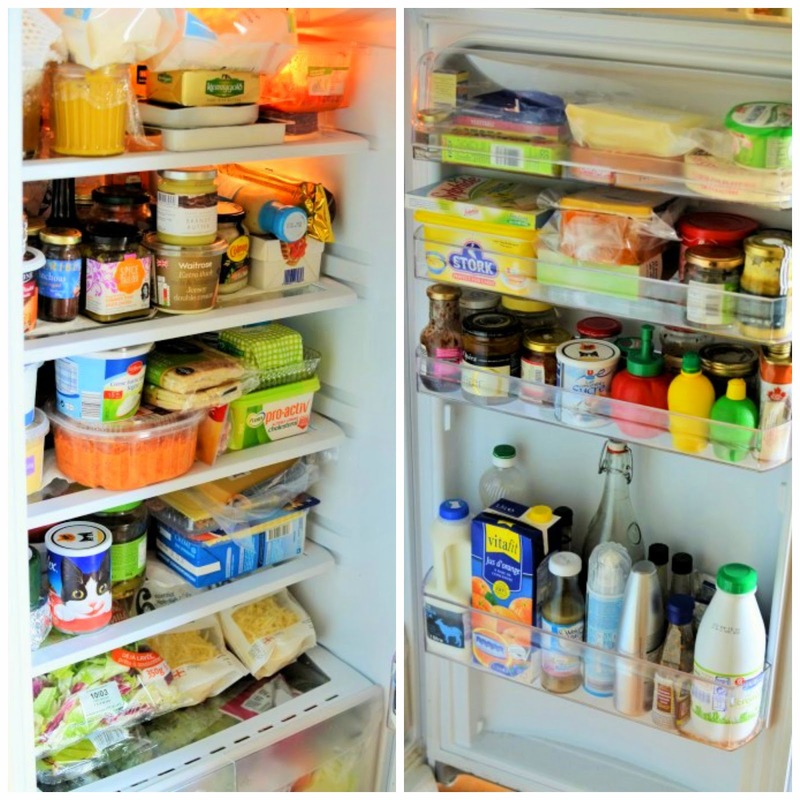 I can't help but compare my messy fridge to the neat ones! I bet all of these get messy at some point during the month. I know mine does. I know I am waiting for Sarah to explain the bread and you are probably alone in the nail varnish in the fridge thing. You still haven't explained why. I do so love peaking in people fridges. I wish i could keep mine as neat as everyone else seems to. Lake District, I think my jar was bought from the House of Bruar! Ahhhhh, well still sounds wonderful, but I have always wondered. Love peeking into others' fridges - last time I tried to photograph my fridge I had a dancing child in front of it and gave up getting a good pic. I never keep bread in the fridge but it is very good for fruit that is about to expire in the heat. The nail varnish made me think of people saying that when it gets really hot you should put your underwear in the fridge to cool you down - not sure if anyone ever does it. Haha the underwear certainly makes the nail varnish seem tame. Maybe we should find out what other odd things people keep in the fridge.